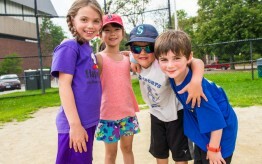 Viking’s KinderKickers is a fun and instructional youth soccer league in Brookline. The first 20 minutes of the class is treated like a soccer practice. During practice, kids learn new skills and the rules of soccer. Once practice is over, kids play a game against one of the other 5 teams. Each team is coached by a member of Viking’s staff. Each child receives a Viking T-shirt in their team’s color!